No tip jar at the racetrack beats the one with the sign that two questionable teenagers put up. The sign reads, “For the collage fund.” Uh-huh. Is that “collage fund” as in “college fund?” And, if so, God bless the admissions director who admitted them. Everyone is out to make a buck. The woman who sells your racing form wants a dollar extra. The white cap who wipes your chair wants at least two. In the ultra-expensive Turf Terrace, note the handwritten spot on your Visa charge receipt for the stiff upper-lipped guy you last saw several hours ago…er, the “captain.” Even the custodian in the bathroom – the man who hands you the paper towel that he’s taken from the wall dispenser – feels entitled to something. Jimmy Tapia, the attendant in the “Gentlemen’s” opposite Section D, knows you have to offer your customers something if you expect them to reciprocate. Tapia doesn’t clean stalls during the day, but his space near the wash basins serves as a kind of commissary. In return for a small gratuity, you can tap into Tapia’s cocoa butter, hand sanitizer, anti-bac soap, mouthwash (two flavors – Original and Cool Peppermint) or six bottles of cologne (Ralph Lauren Polo is the favorite). Or you can treat your taste buds to his five brands of stick chewing gum, Tootsie Roll pops, Chiclets, or peppermint, strawberry and butterscotch hard candy. Naturally, tips come in every form, so some people on Sunday were awash in praise of “Lil Andy” of the Daily Racing Form seminars at Siro’s. Andy was crowing that he tabbed the 14-13 exacta that keyed the $1.5 million superfecta on Travers Day. 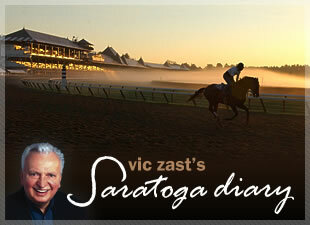 As for other professional tipsters, The Saratogian’s Nick Kling went zero for 12 on the day. Perennial top dog in the paper, Bill Taylor, matched Kling in futility. There was a swami reading tea leaves that did better, which proves the more you know doesn’t mean the more you win – ever! Handicappers fared much better today, although it took them a few races to get into gear. Winners of the first two races paid double-digit mutuels before a series of single-digit win prices were posted. Of special note, Quiet Mover, with Sebastian Morales aboard, took the second and paid $55.00. Trainer Bob Baffert sent out a promising 2-year-old filly named Heavenly Vision to break her maiden in the sixth. After losing twice with Spaniard at the meet, Heavenly Vision’s win must have been gratifying, if not somewhat surprising. Linda Rice continued her mastery of turf sprints. Her number 1, Lady Rizzi, beat her number 1a, Myakka, and broke the track record while doing it. The fractions go into the history books as :21.07, :43.24, :54.83 and 1:00.66. In the featured $250,000 Ballerina Stakes (gr. I), Alonso Quinonez made more than a buck for coming to Saratoga to ride the winner. No tip required.